SOE's F2P shooter will shutdown after only six months. 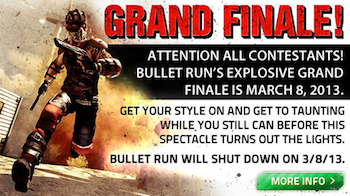 Acony Games and Sony Online Entertainment (SOE) are shutting down their free-to-play shooter Bullet Run after releasing six months ago. They plan to sunset the game over the next month. By March 8th, the game, website, and forums will all vanish into the electronic mist. More details on the shutdown can be found on the official Bullet Run blog. Bullet Run featured a future gameshow aesthetic, where players could earn style points and taunt opponents for audience approval. Perhaps it simply got lost in a sea of F2P shooters. More than likely, a Metacritic score of 53%, with PC Gamer calling it, "a cynical attempt at milking players for money" had something to do with it. Even so, it never seemed to have garnered much attention in the press, especially coming from a high profile publisher like SOE. "While we remain very proud of the game we created and the enjoyment that it gave a lot people, commercial realities have unfortunately made continued support for it unsustainable," Acony posted on their website. "We hope that the loyal community of people who played the game had as much fun playing the game as we had making it, and we would like to offer heartfelt thanks to everyone who has supported us over the last few years." Acony Games certainly faces a grim future. While they will keep the game's source code, a relaunch isn't likely. It's doubtful they expected to have their only project collapse so soon. Currently, Acony's website is blank, save for a goodbye note and an email address. Regardless of the game, it's never a good thing to hear about developers' jobs in jeopardy.